So it has been a very eventful April with large swings on both upside and downside [with a greater bias on downside]. We are now heading into May and as the market mantra goes 'Sell in May and Go Away'. 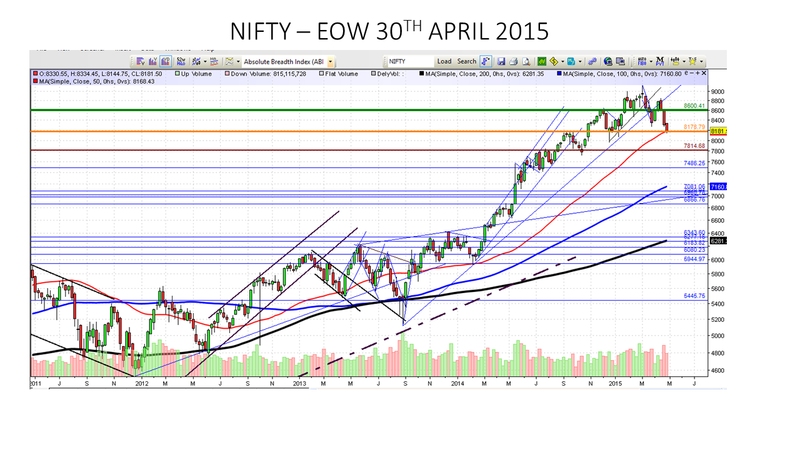 One of the key take-ways was the extremely low values of Nifty spot on Monthly / Weekly and Daily time frames. 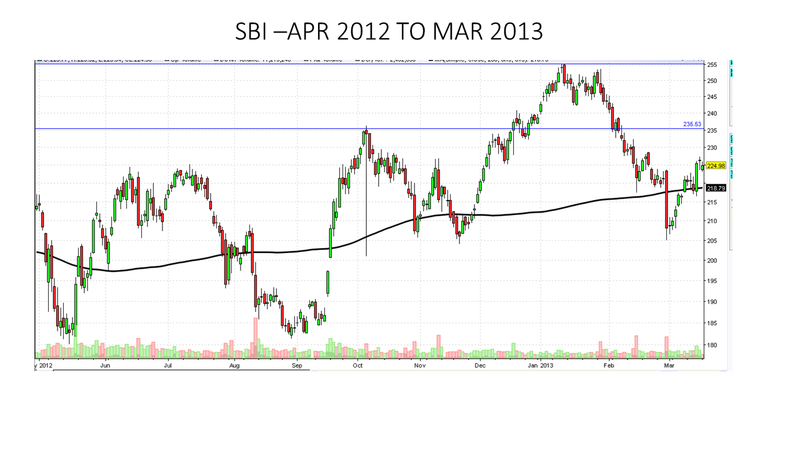 On the daily time-frame, 2 closes above 8380 are needed for further impetus. On the monthly time-frame, a close above 8325 is needed to keep bullish bias in place. As usual, old resistances will turn into supports and new resistances will be formed as Nifty moves into uncharted territory. 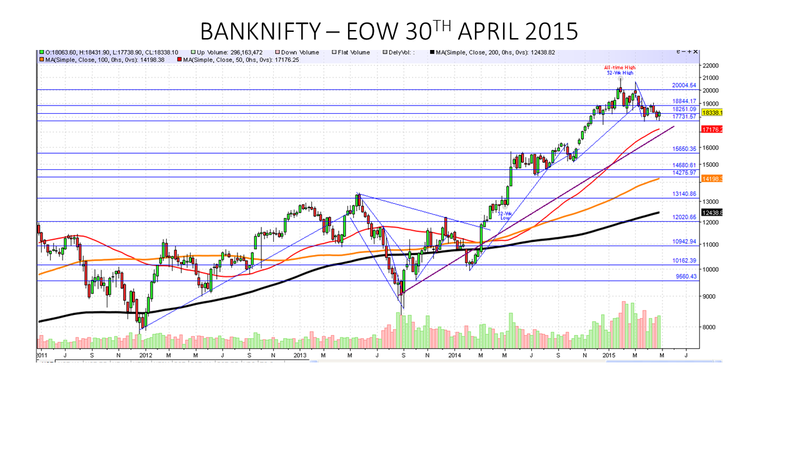 The way BankNifty behaved in expiry week, it seems poised to once again to test the 18800-19200 zone. This wide band of 400 points is very crucial and failure to surpass this will invite steeper cuts on BankNifty towards 17250 over a 6 week period [apprx]. Of course the fall will not be one way just like the rise with corrective phases in between. My personal outlook is that the bull party is over for 2015 and we have entered a major corrective phase where the larger trend is down with corrective rallies in between. [Only a close above old Nifty high will alter this view]. Corrections are good and healthy for the market. Corrections do not mean one way falls always. As we can see the falls are sharp and equally sharp are the rallies as well in between. In the current phase, I think a short-term bottom has been formed or may form one around 8025 levels. The fall has been from 8800 odd levels so a retracement to 8580 is very much on the cards. 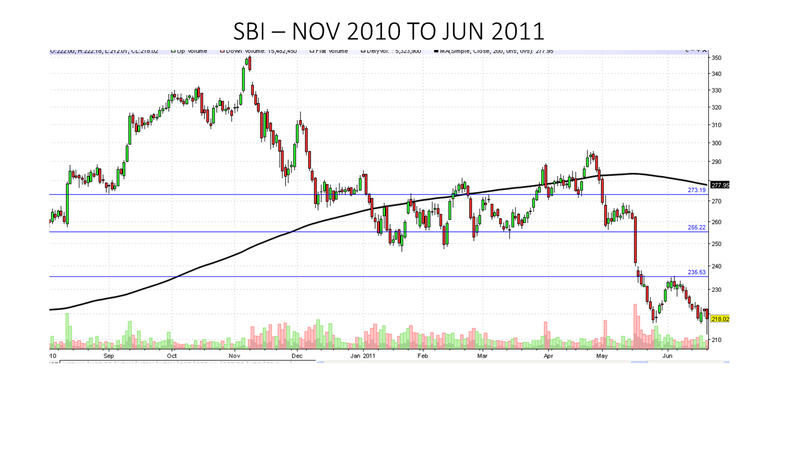 So both on upside and downside, 200 DMA is usually tested thrice for support/resistance before a clear trend emerges. Just because some stocks are trading below 200 DMA now does not necessarily mean a clear downtrend. That being said, it does not confirm uptrend either. I have been saying for the last 6 months that it is time to book out of equities and reduce net long exposure. For new investors and slightly risk averse investors, it is better to stick to the SIP mode. Decide on a corpus of say 1k to 2k for counters like LT, SBIN, Tata Steel, NiftyBees, BankBees, JuniorBees etc. With a constant amount, keep accumulating the number of units and over a 3 year horizon, they are bound to yield 20% CAGR. For the larger picture, let us not forget that 7200-7400 is a pivotal bottom. Unless a major Lehman Brothers like crisis takes place, the correction will not perhaps extend below this. In case of Black Swan events also, the falls will be accompanied by swift rallies. These are of course larger trends for investors and it is not going to help traders in any way. 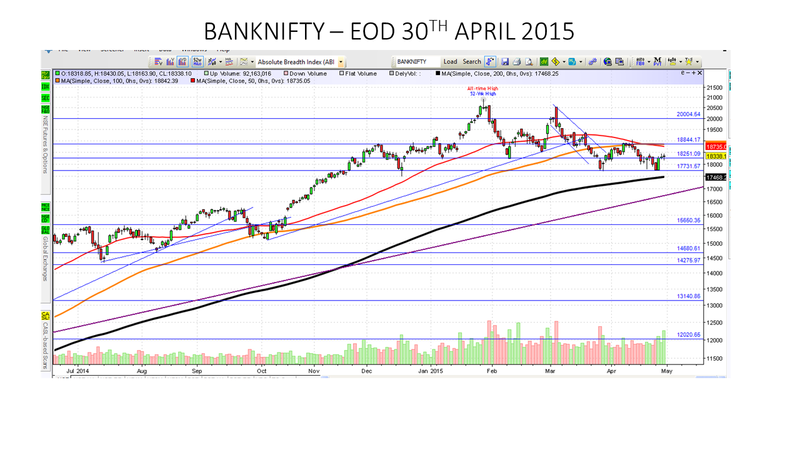 On BankNifty, 18800-19200 is where the short-covering bounce should end [19800 in excessive bullish mood]. These levels keep changing on a daily basis and will be updated on the twitter feeds. The fall has been sharp and a short-covering bounce is very much on the cards within then next 5 trading sessions. Ride that wave but bear in mind the critical resistances as LARGER TREND will assert itself on Thursdays / Fridays and towards the the end of May. 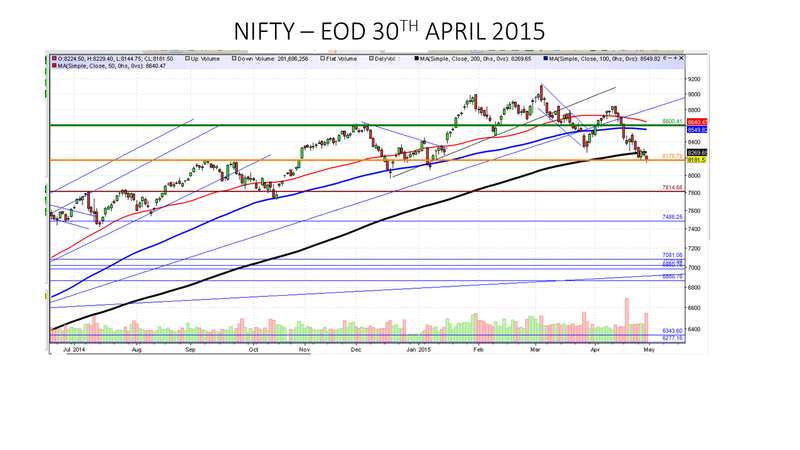 Assuming the larger trends go as per these lines, the downward phase will likely last till 21st June. 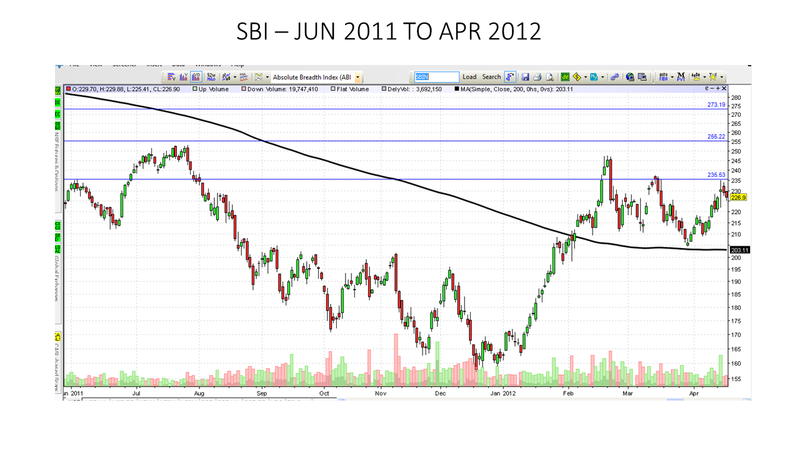 Enjoy the upside and be alert and prepared for the larger trend where a lot of bucks are waiting to be made. The UK elections and MAT issue will be reasons attributed to the short-covering rally. For the downleg, any reason like unrest in Europe, rupee weakening, oil prices hardening - any excuse can be used. April, May and June are exciting months for trading both upside and downside; April certainly gave that though I admit that the downside was more than anticipated. Now enjoy May and June as well.